Changing career paths can be an intimidating prospect requiring one giant leap of faith – and there are no guarantees it will pay off. That’s exactly what Muthu Rajendran did when he made the decision to enter the world of franchising. 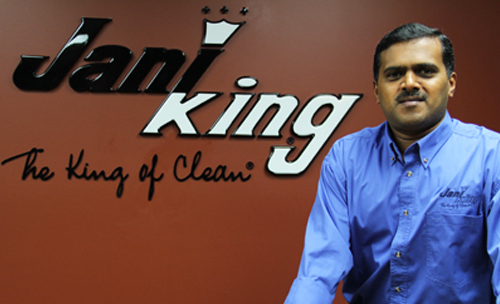 Since starting his commercial cleaning franchise in 2009, Muthu has grown his Jani-King franchise into the largest in Ottawa. We sat down with Muthu to learn more about his success. I was born in Chennai, India and studied to become a mechanical engineer, but ultimately chose not to purse full certification in that field. My career has led me to many places, but it was my experience working with Tim Horton’s that exposed me to the world of franchising. What motivated you to invest in a franchise? I was working as the general manager of a Tim Horton’s franchise, and started to think about running a business on my own as a source of greater financial freedom. My experience working with Tim Horton’s taught me about the world of franchising and how it works. It’s a proven model. Why did you choose Jani-King? I did a lot of research. I was interested in Jani-King because it required a very basic initial investment and I was able to grow my business fast because of my experience hiring people. I knew what I was getting into and wasn’t scared of anything Jani-King could throw at me. Our regional support team is very professional, and I’m successful because of them. If you ever feel like you can’t make it, they’re there for you. They’re why Jani-King is different from other franchises. When I started my franchise I was doing all of the cleaning work myself with the help of my family for the first year. I realized that I could only work 8 hours through the night at a building that might need 20 hours labour. I started hiring staff at the end of the 2009 and gradually built my team. I now have more than 40 employees and we have some big clients in Ottawa. We’re cleaning government buildings, manufacturing facilities, warehouses, car dealerships and office buildings.